Keyword Research is the first step to improve Google Ranking on the website. Below, you will find a complete guide to Keyword Research and Analysis. But before starting the article, let us first understand the meaning of the Keyword Research. Keyword Research is a practice to find the best and alternate search terms that people enter into a search engine. 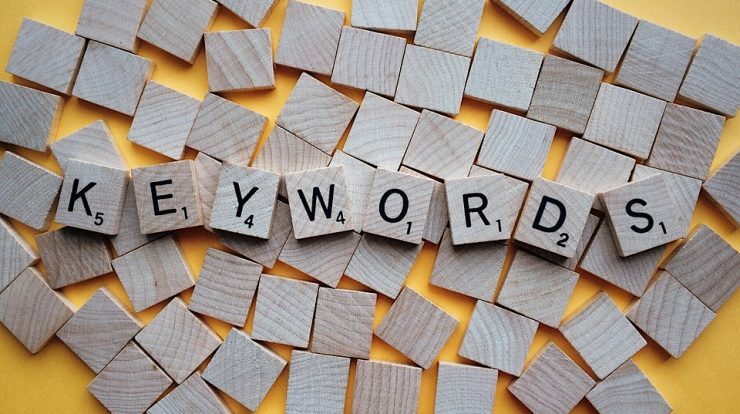 In the layman language, it is a practice to find the best keywords for your content. For Example, In the below snapshot, we had done the basic research for the keyword ‘Embroidery Design‘. 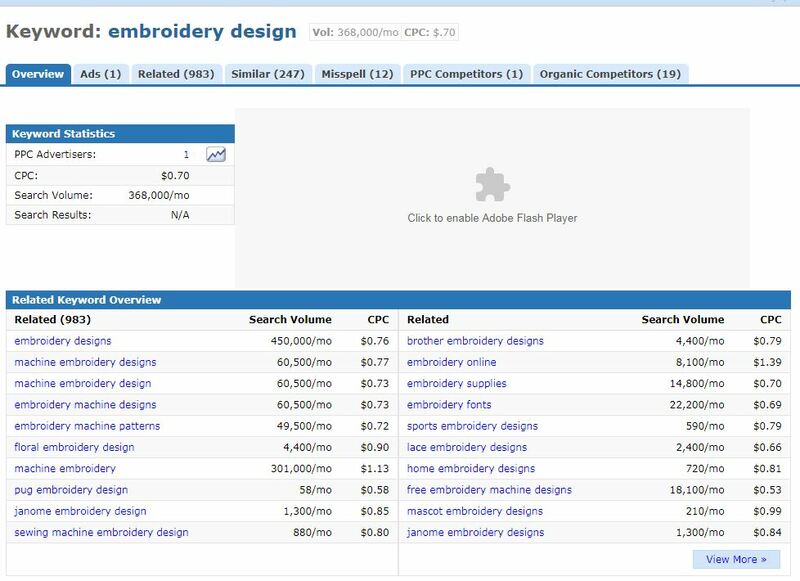 From the above snapshot, you can clearly see that the CPC rate of ‘Machine Embroidery Designs‘ is greater than ‘Embroidery Design‘.But on the other side, the search volume is far lesser than the other. So, if you want more number of users than go for the term ‘Embroidery Design‘ but if you are looking for the high CPC rate keyword then go for the term ‘Machine Embroidery Designs‘. This entire process is known as Keyword Research. How do you feel, if you are running a website about ‘Marketing‘ but it is ranking for the term ‘Engineering‘? Of Course, you will not feel good. For engineers, your website is of no use. Here, the role of Keyword Research comes. Your Website may not rank on the first page. Your Website may rank for the totally un-relevant Keyword. In both the cases, your website will get hurt. So, it is very important to do proper Keyword Research before writing any content. Next, Keyword Research is also one of the critical factors in determining earnings from the website. In Ads Network like Google AdSense ads are based on it surrounding content. So, if you are using low CPC keywords in your article then unknowingly you are attracting low paying ads on your website. To sum up, Keywords Research is very important to create a successful website or blog. At the beginning of the article, we had attached a snapshot showing alternate keywords for term ‘Embroidery Design‘. It is a snapshot of KeywordSpy, a free tool for doing Keyword Research. Doing Manual Keywords Research is a time-consuming and tricky process. It involves lots of factors to be considered. So, it is always advisable to do research using an automated tool. There are many free Keywords Research tools available online. SEO Tools, SEO Review, and KeywordSpy are our favorite one. These three tools are completely free to use. All the basic information like the Alternate Keywords, CPC Rates, and Monthly Volume are available in this free tools. But for the advance information, you need to go for the Paid Version. There is no need for registration or login to use any of these free tools. You can use all these tools without any registration and login. Here, It is important to note down the use of Google in Keyword Research. Yes, you can even use the Google to do the research.There are two ways to do research using Google. Google Instant Search is the first way of using Google for finding Keywords. To use this tool, just go to Google and type your desired keywords as shown in below image. It is another way to find Keywords using Google. 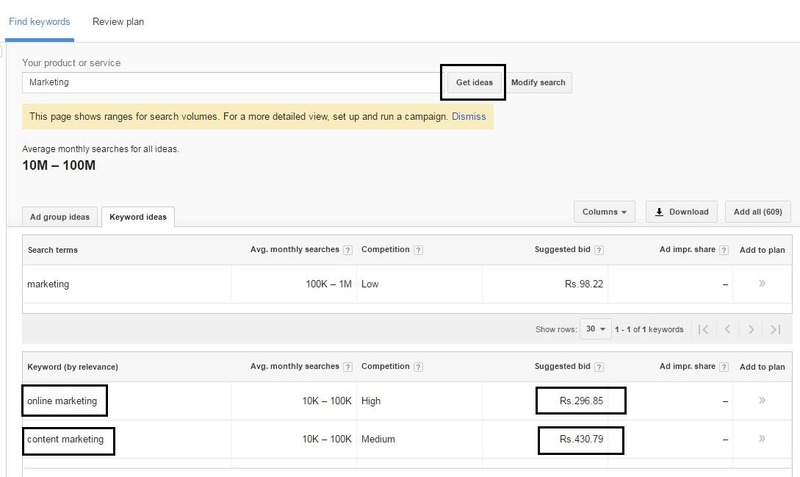 Google Adwords inbuilt tool ‘Keyword Planner’ allow you to find Keywords with CPC rates. 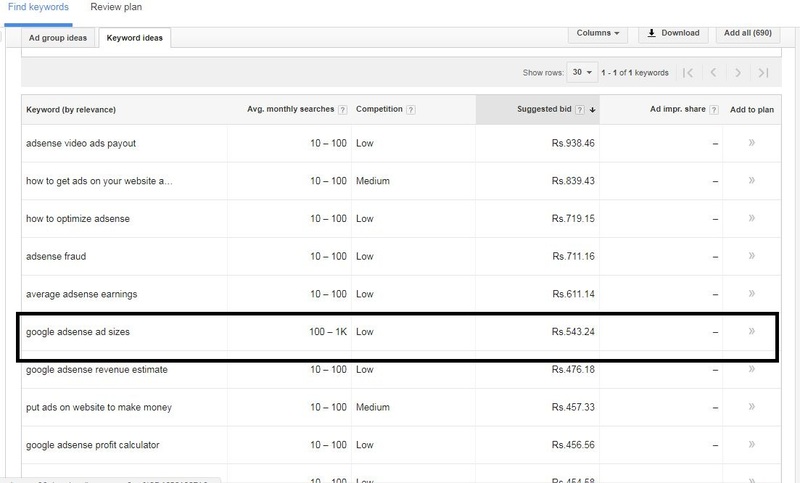 How to Find Keywords using Google AdWords? If you want advance information on the Keywords then you should go for the Paid Tools. 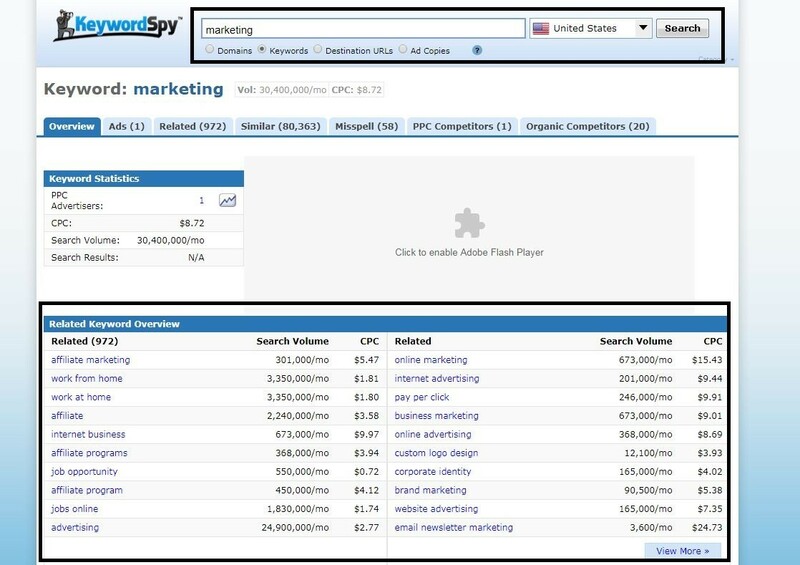 SEMrush and Ahref are the two best Paid Keywords Research Tools available Online. The free trial version is available in both the above tools. You can use the trial version before making a purchase. Keyword Research is a process to find the Keywords for your website or blog. No matter, whether you are using automated tools or doing manually the process will remain same in both the cases. As stated above in the article, Keyword Research can be done either through Online Tools or Manually. But in both cases, the overall logic for the doing the research will remain same. This logic is explained in the below five steps. Let us understand this with an example. Suppose, you are doing Keyword Research for writing an article on ‘How to Increase AdSense Income?‘. In this case, the particular keyword would be AdSense or Increase AdSense. You will start your research with this keyword. Next, do brainstorming to find the alternate keywords. You can do this activity manually or through an automated tool like SpyKeyword or Google Instant Answer. Next, check out the CPC Rate and the Search Volume of all the alternate keywords.Ignore Keywords will very low CPC Rate or Search Volume. Competition Level suggests how difficult it would be to rank for this particular keyword. There are two types of Competition Level. First, Low Competition and Second, High Competition. Low Competition means easy to rank for these keywords whereas High Competition means difficult to rank for this keywords. This is a final step in doing Keyword Research. Select that particular keyword that meets all your requirement like High CPC Rate, High Search Volume, and Lower Competition. If you are writing an article on ‘How to Increase AdSense Earnings?‘ then you should try to use the keyword ‘Google AdSense Ad Sizes‘. As suggested by the Keyword Planner, this term has high CPC Rate and Volume as well. Here it is also important to note that Keyword Planner is not meant for the doing Keyword Research. The main purpose of this tool is ‘to find the right keywords to target for advertisements‘. Further, In the above example, ‘Low Competition‘ means less number of users are willing to show an advertisement for this keyword. Of course, you can even use the dedicate tool for doing this research. We know you are getting confused. If less number of people are interested in this keyword then, Why you should use it? Before making any conclusion, I request you to please refer the below example. Assuming, each users visiting your website will click on the ad, we have worked out the earning potential of the keywords below. Though less number of users are interested in the second keyword, you can still make more money from it. Of course, each and every user coming to your site will not click on the ads but considering future uncertainties it is not possible to calculate an exact number of clicks the website will receive. The one who makes the close estimate will create a successful money making blog or website. If you are asking for the answer in Yes or No, then we will say you should never “Do Keyword Research“. Write for your users, not for the Search Engine. Being so selective for the keywords can disturb your flow of writing. CPC Rate, Search Volume, and Competiton Level do not remain constant. It gets change at a time. Keyword Research is not the only key factor in improving the Google Ranking of your website. There are many other factors also like Loading Speed of the Website, Number of Backlinks etc. It is always advisable to write the article first and then do the keyword research to the extent possible. In this way, your article will be productive and SEO optimized as well. Now your turn. If you have any question or queries on Keyword Research then feel free to share with us. We will be happy to help you. Further, if you find this article useful then please share the way of doing Keyword Research for your website or blog. You can share your technique or queries in the below comment box.